Twenty One years ago, documentarian RJ McHatton took his young son Jason to see his grandfather's grave. Jason immediately asked, "Tell me about him, Dad..." RJ wished he had sat his father down in front of his camera and interviewed him on video. Jason would have then been able to hear his grandfather's voice telling his own stories, experience his contagious laughter and see first-hand what an affectionate character he truly was. 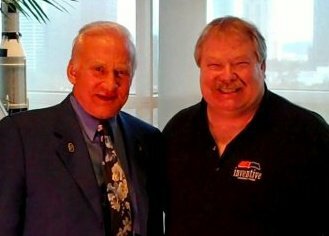 Inspired by his son's question, RJ started shooting and recording history for Genealogical Societies, Hospices, and Habitat for Humanity on a voluntary basis. Inventive Productions, the Autobiography Company, was born. Someone once said, "a person dies twice. Once when they die, and another time when they are forgotten." We don't want to forget you. VALUES: Our values are very important to us. Treat people with respect and dignity. Back your work 100 percent. Go the extra mile to help others. Being completely Honest, Caring for others, and being a good listener. The ten commandments are a pretty good list to follow and live by. You know more about a person or team's character when times get tough than during the easy times. We aspire to have tremendous character, to being there when you need us. 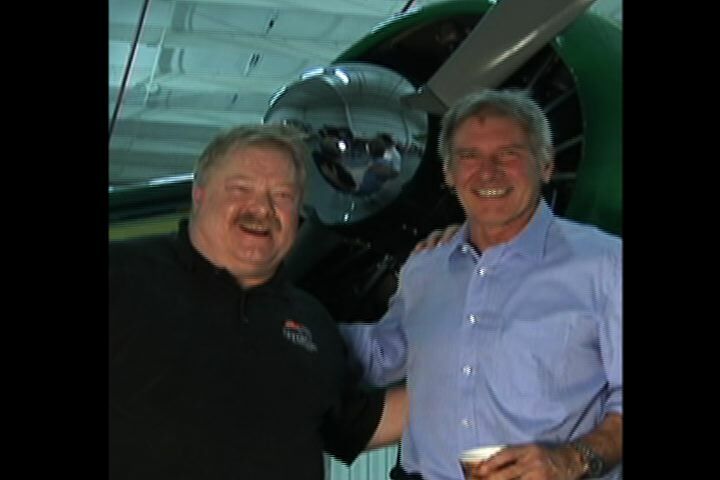 Inventive Productions LLC is a national, full-service, independent Video and Film Production Company. We travel anywhere in the world to do our projects. Our professional crews have written, shot, and directed film and video projects on-location all across the United States and numerous other countries, including Pakistan, Korea, and Kenya. No matter how big your project is, or how small it is, we can help you achieve your vision with Video or Film. 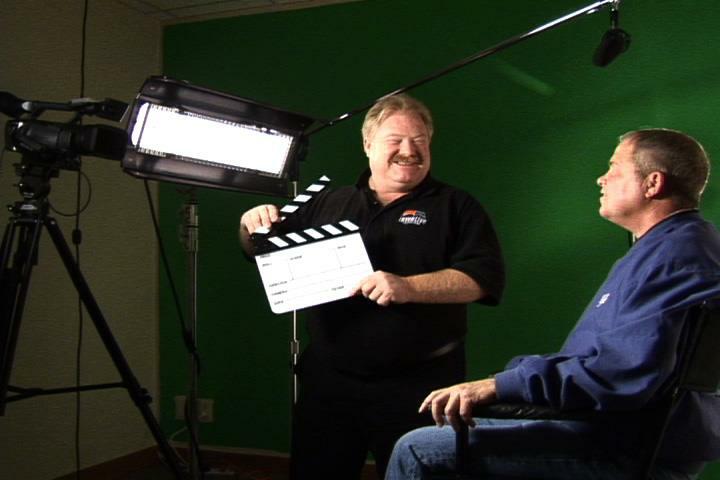 Over the past twenty years we have produced a wide variety of video and film productions, on-location and at our studios. 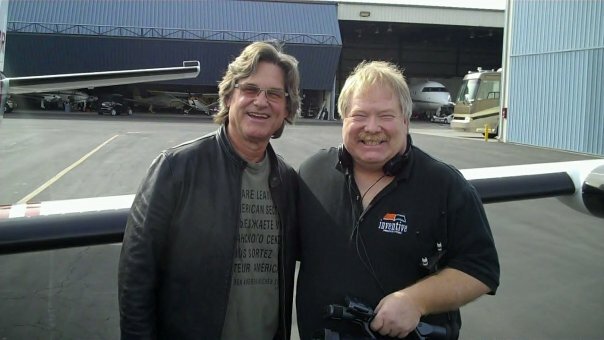 RJ McHatton with daughter Crissy on location shooting a documentary. Inventive Productions LLC is a team of creative filmmakers who are dedicated to helping people tell their stories in their own words. We have helped the new tidal wave for the cottage industry of custom Video Biography and Corporate History DVDs. RJ McHatton is the award-winning writer-director-producer and cinematographer of over 100 documentaries including UMATILLA and THE SHIP OF MIRACLES, director of short films ARREST MOMMY and DUCT TAPE, and the feature film THE RED SUIT. He is a published author of four books of fiction-- the novels MY KIDS and THE DIRTY DEED and BONUS TIME AND OTHER SHORT STORIES, and THE BRILLIANTS (all available at Amazon.com). Ship of Miracles - documentary by RJ McHatton from RJ McHatton on Vimeo. Over the years RJ has written, produced, and directed hundreds of Video Biographies and Corporate History documentaries. 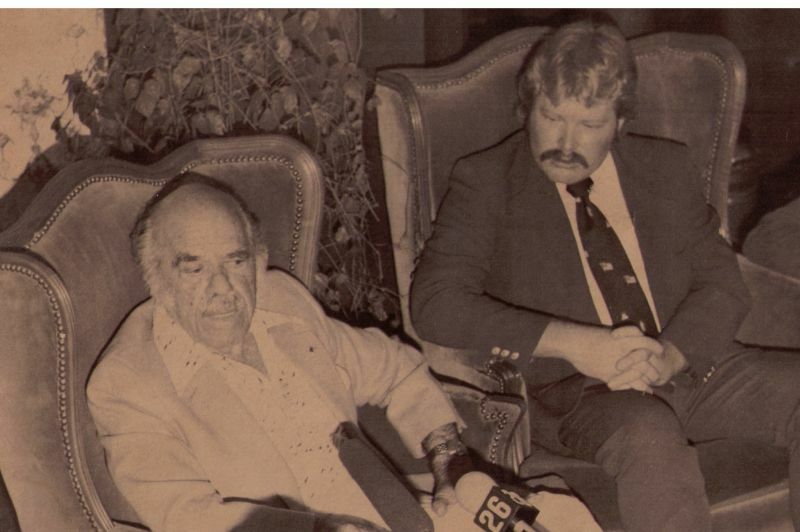 Here is Director Frank Capra with RJ McHatton in 1980.
movie camera in the trunk of his Mercedes. and former Secretary of State Warren Christopher. 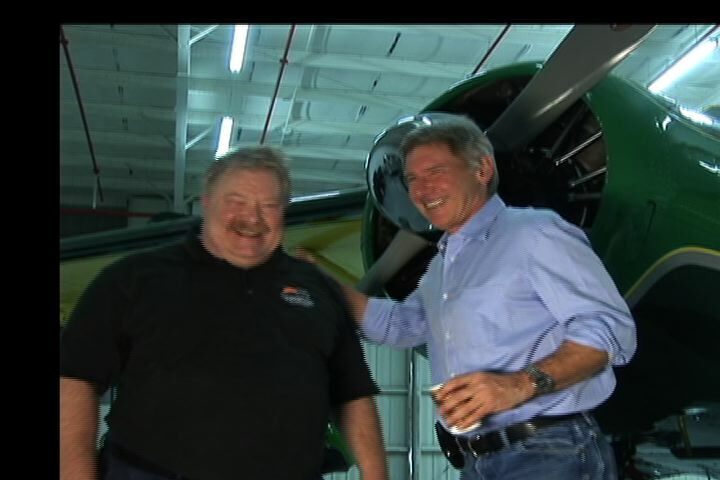 Here are some photos of RJ with Harrison Ford. This year RJ and the Inventive Productions Team are proud of the new feature-length Motion Pictures we are producing. Another exciting project we are making is the new "CEOs of America" Project. Dan Absher, Absher Construction, Puyallup, WA "Best Workplaces Video"
Melissa Acton-Buzard, Chameleon Technologies, Kirkland WA "Best Workplaces Video"
Peter Allen, Morgan Stanley, Los Angeles, CA "Flying Man Documentary"
Rick Anderson, Moss Adams, Seattle WA "Best Workplaces Video"
Thomas Barghausen, Barghausen Consulting Engineers, Kent WA "CEOs of Seattle Documentary"
Ed Belleba, Friends of Youth, Redmond WA "Eastside Business Awards"
Eric Bensussen, BDA & Associates, Woodinville, WA "Best Workplaces Video"
Al Bentley, Seattle WA, "New Fighting Seabees Documentary"
Bob Berntson, Berntson Porter CPA, Bellevue WA "Best Workplaces Video"
Dan Blanchard, American Safari Cruises, Seattle WA "CEOS of Seattle Documentary"
Herb Blanchard, Seattle WA "Veterans History Project"
Christina Brandt, AtWork!, Bellevue WA "Eastside Business Awards"
Paul Buckman, Pathway Medical Technologies, Bellevue WA "Eastside Business Awards"
Scott Carsberg, Seattle WA "Chefs of Seattle Documentary"
Kurt Carlson, Propel Insurance, Tacoma WA "Best Workplaces Video"
Pedro Castro, Magellan Architects, Redmond WA "Eastside Business Awards Video"
Christian Chabot, Tableau Software, Seattle WA "CEOs of Seattle documentary"
Jim Charpentier, BNBuilders, Seattle WA "Best Workplaces Video"
Tony & Annie Cheng, Netstar Communications, Bellevue WA "Best Workplaces Video"
Howard Chermak, Chermak Construction, Edmonds WA, "Best Workplaces Video"
Warren Christopher, former Secretary of State, O'Melveny & Myers, Los Angeles, CA "Flying Man Documentary"
Dave Coffman, Coffman Engineers, Seattle WA "Best Workplaces Video"
Carla Corkern, Talyst, Bellevue WA "Eastside Business Awards Video"
Robert Cremin, Esterline, Bellevue WA "Eastside Business Awards Video"
Cathy Crosslin, CEO of Instar Performance, Redmond WA "Case Study Videos"
General John Dailey, Smithsonian Institute, Air & Space Museum, Washington DC, "Flying Man Documentary"
Dr. Mark Dedomenico, PRO Sports Clubs, Redmond WA "CEOS of Seattle Documentary"
Melanie Dressel, Columbia Banking System, Tacoma WA "Best Workplaces Video"
Jay Deutsch, BDA & Associates, Woodinville WA "Best Workplaces Video"
Tad Devine, Corona Del Mar, CA "Flying Man Documentary"
Matt Diefenbach, Turnstyle Design, Seattle WA "Best Workplaces Video"
Eric Donnelly, Seattle WA "Chefs of Seattle Documentary"
Tom Douglas, Seattle WA "Chefs of Seattle Documentary"
Joan Duffell, Committee for Children, Seattle WA "Best Workplaces Video"
Kathryn Flynn, Fertile Foods, Bellevue WA "Cooking for Fertility DVD project"
Bob Frause, Frause Inc., Seattle WA "Best Workplaces Video"
Shannon Gallusha, Seattle WA "Chefs of Seattle Documentary"
John Gavin, actor (appeared in Alfred Hitchcock's "Psycho"), former Ambassador to Mexico, Beverly Hills, CA "Flying Man Documentary"
Nicole Gelpi, Yellow Mountain Stoneworks, Seattle WA "Artitudes Design Testimonial"
Kevin Goodwin, Sonosite, Bothell WA "Eastside Business Awards Video"
Daisley Gordon, Seattle WA "Chefs of Seattle Documentary"
Ben Graham, Turnstyle Design, Seattle WA "Best Workplaces Video"
Cam Green, Green Rubino, Seattle WA "Best Workplaces Video"
Dan Greenshields, Sharebuilder, Bellevue WA "Eastside Business Awards Video"
Bert Gregory, Mithun, Seattle WA "CEOs of Seattle Documentary"
Chuck Grouws, CHG Building Systems, Seattle WA "Best Workplaces Video"
Janet Haberbush, Windermere Real Estate, Seattle WA "CEOs of Seattle Documentary"
Brian Haner, Image Source, Kirkland WA "Best Workplaces Video"
Scott Harrison, Barclay Dean, Bellevue WA "Eastside Business Awards Video"
Fumiko Hayashida, Seattle WA "Video Biography" "Japanese internment stories"
Rick Head, Clothier & Head, Seattle WA "Best Workplaces Video"
John Hempelmann, Cairncross & Hempelmann, Seattle WA "Best Workplaces Video"
Karl Hermanns, SeedIP, Seattle WA "Best Workplaces Video"
Andrea Heuston, Artitudes Design, Issaquah WA, "Best Workplaces Video"
Shari Marion-Hoff, Hawkeye Cohesion, Seattle WA "CEOs of Seattle Documentary"
Brad Jackson, Two Degrees, Seattle WA "Best Workplaces Video"
Naveen Jain, Intellius, Bellevue WA "Eastside Business Awards Video"
Dave Johnson, Elite Fitness, Bellevue WA "CEOS of Seattle Documentary"
Leif Johnson, Exvere, Seattle WA "Cave B Winery Resort Video"
Marty Johnson, Seattle WA, "New Fighting Seabees Documentary"
David Jones, Projectline, Seattle WA "Best Workplaces Video"
Tom Jones, Moraga Vineyards, Bel Air CA, "Flying Man Documentary"
Dara Khosrowshahi, Expedia, Bellevue WA "Eastside Business Awards Video"
Mike Kichline, Projectline, Seattle WA "Best Workplaces Video"
John Koenig, Seattle WA "New Fighting Seabees Documentary"
Robert Kunold, Foster Pepper, Seattle WA "Best Workplaces Video"
Clay Lacy, Clay Lacy Aviation, Van Nuys, CA, "Flying Man Documentary"
Lola LeBlanc, Group Health Cooperative, Seattle WA "Best Workplaces Video"
Anika Lehde, Projectline, Seattle Wa "Best Workplaces Video"
Angie Lepley, Tangerine Travel, Bothell WA "CEOs of Seattle Documentary"
Nancy Leson, Seattle Times, Seattle WA "Chefs of Seattle Documentary"
Peter Levine, Seattle WA "Chefs of Seattle Documentary"
Charlie Liekweg, AAA Washington, Bellevue, "Best Workplaces Video"
Vuong Loc, Seattle WA "Chefs of Seattle Documentary"
Scott Luttinen, Washington Trust Bank, Seattle WA "Best Workplaces Video"
Jeffrey Lyon, GVA Kidder Mathews, Seattle WA "Best Workplaces Video"
Edgar Martinez, Branded Solutions, Kirkland WA "Best Workplaces Video"
Janice Merriweather, Long Beach CA, "Flying Man Documentary"
Francis Meyers, Seattle WA "New Fighting Seabees Documentary"
Eileen Mintz, Seattle WA "Chefs of Seattle Documentary"
Bob Moeller, Seattle WA "New Fighting Seabees Documentary"
Sharon Mooers, Olive Crest Homes for Abused Children, Seattle WA "Artitudes Design Testimonial Video"
Bobby Moore, Seattle WA "Chefs of Seattle Documentary"
Peter Mullin, MullinTBG, Beverly Hills, CA "Flying Man Documentary"
Bill Neubauer, Seattle WA "New Fighting Seabees Documentary"
Kelly Noonan, Stokes Lawrence, Seattle WA "CEOs of Seattle Documentary"
LeRoy Nosbaum, Itron, Liberty Lakes, WA "CEOs of Seattle Documentary"
Naomi Novotny, SaltWorks, Bellevue WA "CEOs of Seattle Documentary"
Eric Overton, Sparling, Seattle WA "CEOs of Seattle Documentary"
Sekou Page, Microsoft, Los Angeles, CA "Entirenet Labcast Video"
Ashton Palmer, Expedition Trips, Seattle WA "CEOs of Seattle Documentary"
Melinda Partin, Worktank, Seattle WA "CEOs of Seattle Documentary"
Gordon Perin, Seattle WA "New Fighting Seabees Documentary"
David Price, CEO American Airports Corp, Santa Monica CA "Flying Man Documentary"
Thierry Rautureau, Seattle WA "Chefs of Seattle Documentary"
Eric Rhoads, Redondo Beach CA, "Flying Man Documentary"
Karen Ridlon, Eastside Baby Corner, Bellevue WA "Eastside Business Awards"
Chuck Riley, Lane Powell, Seattle WA "Best Workplaces Video"
Jim Rogers, Rogers & Norman Insurance, Seattle WA "Best Workplaces Video"
John Rubino, Green Rubino, Seattle WA "Best Workplaces Video"
Marty Schillaci, The Resource Group, Renton, WA "Best Workplaces Video"
Stan Selden, Selden Furniture, Fife, WA "CEOs of Seattle Documentary"
Greg Shaw, Seattle, WA, "Veterans History Project"
Cleo & Carroll Shelby, Beverly Hills, CA "Flying Man Documentary"
Casey Sheldon, Weber Shandwick PR, Seattle WA "Best Workplaces Video"
Holly Smith, Seattle WA "Chefs of Seattle Documentary"
H. Russell Smith, Avery Dennison, Pasadena CA "Flying Man Documentary"
Sonosite Corp, Bothell WA "Convention Case Study and Testimonials"
Ethan Stowell, Seattle WA "Chefs of Seattle Documentary"
Brian Sweet, Seattle WA "New Fighting Seabees Documentary"
Angelynn Talcott, Puget Sound Business Journal, Seattle WA "Best Workplaces Video"
Admiral Ted Taylor, Seattle WA "New Fighting Seabees Documentary"
Patrick Tessier, Northwest Laboratories, Bellevue WA "Best Workplaces Video"
Paul Thayer, former under Secretary of Defense, Beverly Hills CA, "Flying Man Documentary"
Bill Tilley, Shakeys Pizza Parlours, Beverly Hills CA "Flying Man Documentary"
General Guy Townsend, Mercer Island WA "Veterans History Project"
Heather Trescases, Eastside Heritage Center, Bellevue WA "fundraising video"
Tom Varga, CFO Selections, Bellevue WA "Best Workplaces Video"
Carlos Veliz, PCSI Design, Bothell WA "Eastside Business Awards Video"
David Victor, Seneca Real Estate Group, Seattle WA "Best Workplaces Video"
Mark Walsh, The Schuster Group, Seattle WA "Best Workplaces Video"
Alex Wasserman, Elite Fitness, Bellevue WA "CEOs of Seattle Documentary"
Steve Watson, Turnstyle Design, Seattle WA "Best Workplaces Video"
Ben Wiener, Vancouver WA, "Generic Drug Revolution Documentary"
Lissa Myers Wolfe, Pismo Beach, CA "Flying Man Documentary"
Roy Wolford, Northrop Grumman, Ranchos Palos Verdes, CA "Flying Man Documentary"
Patrick Yalung, Wells Fargo Bank, Seattle WA "Best Workplaces Video"
Jun Young, Microsoft, Redmond WA "Artitudes Design Testimonial Video"
David Zook, Tutoring Club, Bellevue WA "Eastside Business Awards Video"
Mark Zoske, SaltWorks, Bellevue WA "CEOs of Seattle Documentary"